With a 16 starting block capacity, the Transporter starting block cart sets itself apart from all other models. 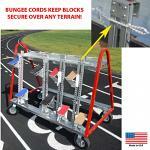 Designed to accommodate virtually any starting block. Large wheels allow for easy transport over any surface. Steel construction with durable powder coat finish.